Armchair Fiction presents extra large editions of classic science fiction double novels. This edition features two great tales. 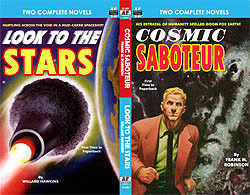 The first novel, “Cosmic Saboteur” deals with a traitor to Humanity. They told him that he hated the Earth, beating him until he nearly died—for he must be convinced! But it was all part of his wicked indoctrination as a Cosmic Saboteur. But hanging in the balance was the future of his own people—and his own planet. For if the Thuscans had their way, every major city on Earth would eventually become a smoking ruin, paving the path for an alien takeover and the end of mankind. Veteran sci-fi author Frank M. Robinson spins a taut tale of futuristic espionage, intrigue, and betrayal in this fine novel of a planet on the verge of total destruction. The second novel is another sci-fi goodie, “Look to the Stars” by Willard Hawkins. It was like a back door to eternity. There were eight of them—four men and four women—and some of them were running from the law. Random chance brought them to the mountaintop cabin of Eli Thornbolt, a reclusive scientist whose scientific dreams needed money to become a reality. But when his guests walked through the back door of his cabin, they soon found themselves on an incredible journey through the vast depths of outer space, to a brave new world—a world whose actual formation was spawned by the very entrance of their spacecraft into that region of the galaxy. Join these unwitting space pioneers in their struggles as they fly through space to destinations unknown, and join them as they strive to survive on an unknown planet whose location was a complete mystery!